5 Days to a Spring Cleaned Home! You may very well have a thorough spring cleaning checklist that your mama and her mama before her used, but for those of us whose mothers avoided cleaning like the plague by either ignoring it or hiring a housekeeper, we need checklists to follow before we settle into our own annual routines. For the non-Martha Stewarts among us, I’ve put together a zero planning required, simple-to-follow spring cleaning checklist that even busy military families can accomplish in just an hour a day midweek. This list assumes that you regularly maintain a basic cleaning schedule of vacuuming, mopping, and wiping down your appliances as needed. For more tips on cleaning supplies, check out on our post on Green Cleaning Creates Less Waste for Your Next PCS! I’m sure by now you’ve heard the tragic story of the seven children in Brooklyn who perished in a house fire in March. Their hot plate caught on fire, and the flames ravaged the house in minutes. While the family had a fire alarm in the basement, they did not have one on either the ground floor where the kitchen was or on the second floor, which is where the family slept. Hot air rises, and so the basement’s fire alarm did not sound in time. Before caring for any other part of your home, make sure that you “spring clean” your safety alarm system. If you have alarms in place, dust them off and replace the batteries, check that they are working, and then establish a safety fire drill for your home. While it may be dangerous for a young child to learn to open a window, smoke inhalation or a fire may prove far riskier. Assess your home and your family to create the best plan, but if you are struggling to create a good evacuation plan, ask the assistance of your local fire fighter team. As military families move regularly, it’s important to create a safety and evacuation plan immediately after moving into each new home. If you don’t have alarms in place, consider making this your top priority today. Fires don’t wait until your day off to occur! Today is all about the bedrooms! Open the windows to air out the bedrooms. Then, put your summer bedding in the laundry to freshen up (a refresh or steam cycle is perfect, but you can just rewash if you don’t have either of those settings). Then, pull off the duvet and the covers and either bag them up for the dry cleaners or toss them in the laundry before you store them. Vacuum the dust mites from the mattress, and flip the mattress, if appropriate. Later that evening, store your winter bedding and then dress your bed for summer. You’ll sleep well tonight! Fill a bucket with warm, soapy water and grab a couple of rags and a sponge. Enlist the help of children with this chore to make it go faster. Focus on high traffic areas and simply scrub walls lightly (don’t erase the paint!) with the rags to remove grime, dirt, and dust. Once you’ve completed an area, then you can use the sponge to remove any drip marks. Make sure to run the rag over the floor boards and door knobs, too. Each room should take about 10 minutes. Set a timer on your phone to help you from getting hung up on one silly stain; you’re likely the only person who can see it, so don’t fret. This task could otherwise take you all night. You’ll need a rag, window cleaner, a footstool, and a duster today. First, dust off the ceiling fans. Ideally, you want to dust off your ceiling fans at least once or twice a month to prevent dust from accumulating, but as I’ve recently had several friends admit that it had never occurred to them to wipe off the top of the ceiling fan, I thought it’d be a good idea to include it on our to do list here! 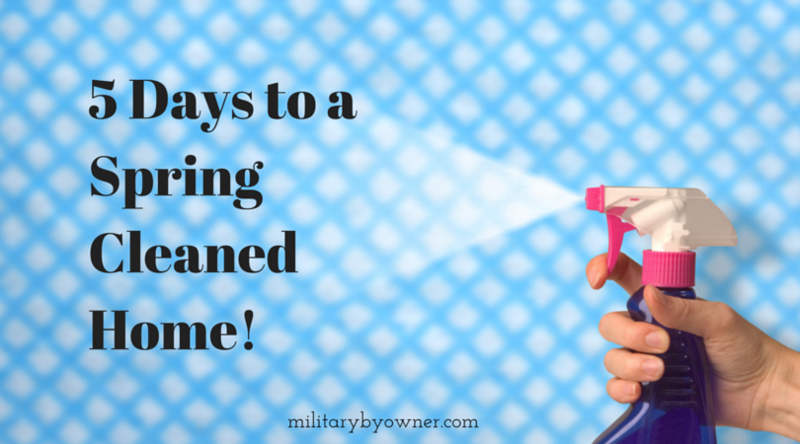 Then, check out our list of how to make your own green cleaning supplies to create your own window cleaner. If you have window drapes, check their tags to see if they can go into the dryer to be freshened up or see if you need to send them to the dry cleaner to remove months of grime and dust. If you just have blinds, then dust them off first before wiping down the windows. Day 5: Schedule the big stuff! Congratulate yourself on all of your hard cleaning work, and then sit down a pen and your calendar. Today you’ll create a to-do list for larger or exterior items to either outsource or complete over the next few months. Once the pollen season has ended, for example, consider hiring a company to pressure wash your home if you don’t own your own pressure washer. You’ll also want to add garden planning onto your calendar. Now that the seemingly endless winter is behind us, you may find that you need to apply new mulch. Schedule a biannual tune up of your air conditioner to keep it in optimum working order. If you have a fireplace, make sure to schedule a chimney sweep. Now that everything is clean and shipshape, you may be motivated to hold a yard sale. 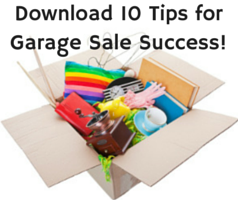 Download tips for your most successful garage sale yet!